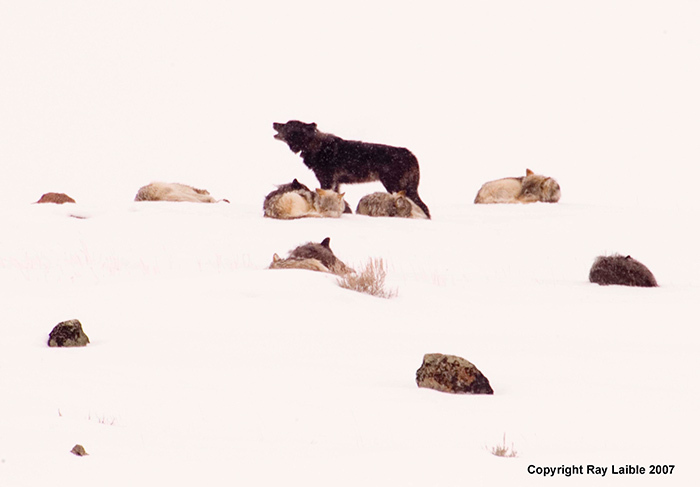 Ray Laible of Pocatello, Idaho, an inveterate photographer and wolf watcher made this high key photo of the Druids. It was taken this month. Thanks for sharing it, Ray. Thanks so much Ray for the photo – I can almost hear the howl here in PA!! And, as always thanks to you too Dr. Maughan for the time, effort and PATIENCE that you put into this site!! My hubby and I can’t wait for May for our 4th trip in as many years to this wild, absolutely gorgeous and wonderful “Park”. Great photo. Really shows why I became involved. Thanks Ray and Ralph. Awesome picture Ray. Love it. Keep up the good work! I too, can’t wait till early June to get back to Yellowstone and see the Druids and all the other wolfy’s. Thanks for the great Valentine’s Day gift of a picture of my “sweetie”, Wolf 302M. I’m sure he’s there, but the question is: is that him howling, or is he snoozing in the snow?